Trompe Loeil Stenciling to Fool the Eye! 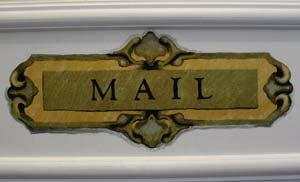 Stenciling with Trompe Loeil and faux finishing effects is a fun way to add those little personal touches to your home. This page is going to introduce you to some of the stencils that I have created and show you how to create the right effect to pull off the trick and make your visitors think (even for just a minute) that what they are seeing is the real thing and not a painting by you. 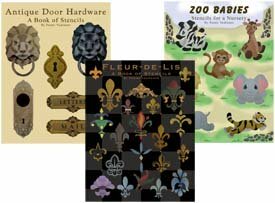 When you finish absorbing all that is on this page, go to Trompe L Oeil for a Free Stencil and to watch a video about painting with these unique patterns. You can also find the video below on this page. Stencils are a great way to start any project because they get the basic outline of an object in place for you. Personally, I find it hard if not impossible to swipe a brush through paint and get a nice free hand asymmetrical painting. For a Trompe Loeil effect getting the size, proportions and shape right is essential therefore stencils are the perfect tool to start with. Here is the Key Bow. First, I'll show you a close up view so you can see the details. 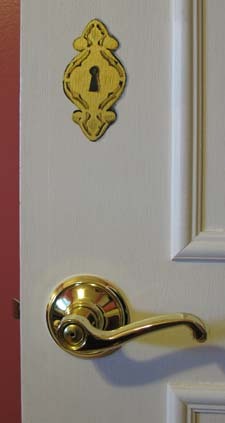 Below is a farther away view with the door knob so we can discuss shadows. Notice how the paint strokes become more blended to the eye from this view and to the next view. And of course in this closeup view the wood grains are more pronounced. Notice on the closeup view that I painted some shadows on the right of the key bow. I was able to use the lines of the stencil to follow and create a shadow. Now I want you to remember that I said I wasn’t a painter and that’s why I’m so passionate about stencils (especially when create trompe loeil). You’ll see that the shadow lines are not exactly smooth and perfect. That’s OK because when you look at the view from farther away it’s not so noticeable. You see, nobody is going to have their face that close to the painting. Just think of it this way - at the Louvre, you have to stand back several meters from the Mona Lisa to get full appreciation of the painting (Yeah, yeah...and security). Because this image is painted on a white surface, I used black and gray paint to run the shadows along the edges on the right side with a very thin bristled brush. Don’t be nervous about this. Just let the brush do the work. Go back and forth between the two colors until you feel comfortable with the shadows. Don’t be concerned with making sure the lines are perfectly straight. Remember nothing in life is that perfect. And don’t forget that it’s just paint and if you don’t like the results you can cover it up with more paint when it dries. The object is to just do it! Give it a try and enjoy the creation of art. It’s a wonderful, fulfilling thing to do and I’m sure that the finished work will be something you can be proud of. Another reason that I wanted to show you this view is so that you can see the natural shadows that are thrown from the door pull and the decorative moulding. Study the area where you are painting your image and make your shadows or highlights reflect the light shining on that area. If the light is coming from the left, paint shadows on the right; if the light is coming from the right, paint shadows on the left (and you get the picture). Now, we talked about using black and gray to make shadows on a white background but what if your surface color was different. Well, then you need to use a couple of shades that are darker. You can create this color by adding black to paint that matches your surface color. It should only take a small amount of black to get the results you need. You still want the original color to show but appear a little darker in the shadow area. I always find that putting a couple drops of paint on a pallet and combining them as I brush them onto the surface helps me to see what is going to look good. If the color is too light, dip the paint in black; if it’s too dark, dip it in the lighter color. You’ll be surprised at the outcome if you just let the brush do most of the work. Sometimes the brush leaves the perfect lines for the look you want. If you don’t have the original paint of your surface color than do the best you can to find a close match. You’ll be adding black anyway so it doesn’t have to be a perfect match. Of course, you want to make sure that’s is close. We’ve talked a lot about shadows but what about highlights. Light shines on objects and reflects or alters the colors we see. So to create a trompe loeil image you should take into account not only the shadows created by light but also the highlights. Actually the same rules for creating shadows applies to creating highlights except using whites and lighter colors than your surface. 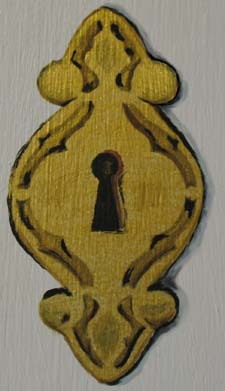 Here’s another example of a trompe loeil image done with Faux Painting Stenciling techniques. I added shadows below and highlights on the embellishments on all four sides. Again, the stencil get you there and then you need to add the touches that make it belong to where it is placed. If you can’t find a stencil for the image you want to create then make one. It’s not that hard. If you can find a photo of what you want, them trace using a thin tracing paper and break it down into layers for the level of detail you want. For more information on how to do this visit Make Your Own Stencil for all the details. In an effort to bring you a complete solution for all of your stenciling needs, we now have a Stencils Catalog for you to browse a large variety of designs. Below is a sample of the design books that we offer. This book has the stencils used as examples on this page. Each book will come to you as a down-loadable pdf file in your e-mail. Just check your e-mail after purchase for the link to connect to your file and print or save. It's that easy! 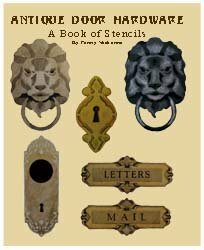 This collection includes 5 designs- A Lion Head Door Knocker, Key Bow, Lock Plate and Mail Box Plaque (with two word options). These images should add a little fun and even some humor to the doors in your home while they introduce a touch of the past. 25 Page PDF File will be sent to your e-mail directly after purchase! If you’d rather get your Stencil Pattern Books in Print (like these), then visit our Printer’s Book Shop. You’ll find all of the stencil designs used as examples throughout this site. Ready for another trompe loeil project? Well, you’ll be amazed at what you can do with a little paint and some stencils. 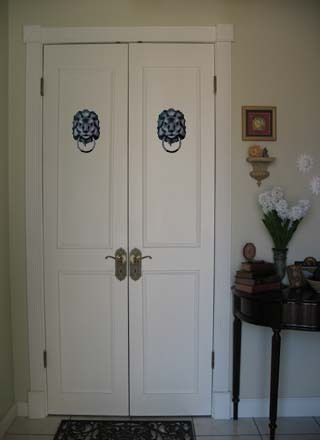 These doors were transformed from plain dark brown stained doors to this! Follow along as I tell you how it was done with Trompe Loeil Stencils. I truly hope that you have found what you were searching for and I hope you give trompe loeil stenciling a try. Oh wait! Here's that great video I promised you! Return to Home Page from Trompe Loeil Key Bow Project.